Joplin, Missouri was hit by an F5 tornado in May of 2011, as a resident of Joplin with a home undamaged, my summer overflowed with activity balancing my full-time job with lots of volunteering. When the dust finally began to settle in late summer, I was ready to get my hands dirty and create something peaceful in my garden space. Unfortunately, 2011 was before I began taking photos at each step through my projects, but I’ve attempted to explain the process here in detail so you can make your own above ground pond. This is very easy and very cheap- even I was surprised at how well this idea worked! Using shims, I was able to create my pond on a slight hillside but maintain an even water level. 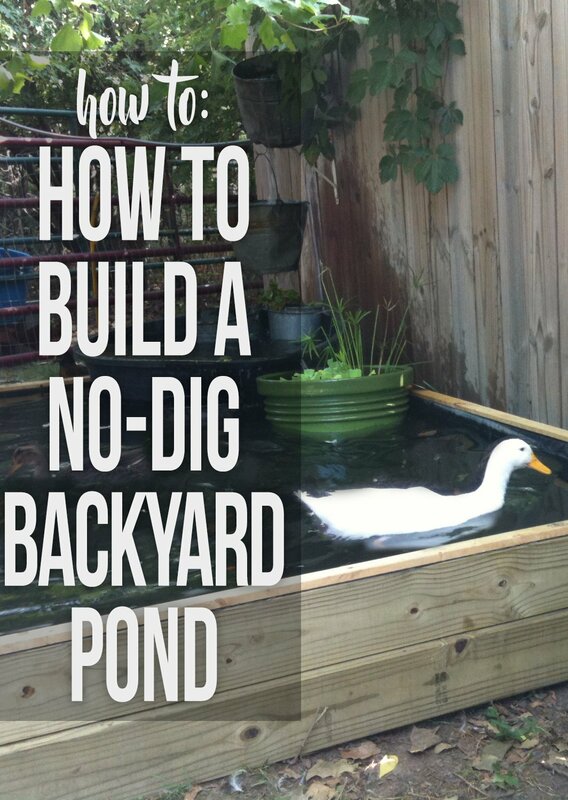 Best of all, unlike other garden pond projects, there is absolutely no digging involved! 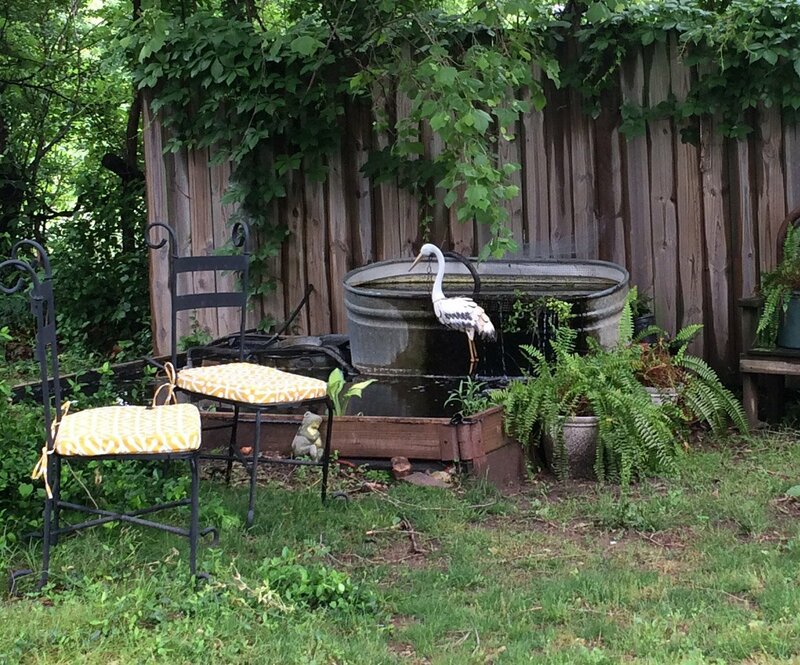 I dismantled this pond in late 2015 and repurposed the materials, but even after four summers and winters, this pond was structurally sound and leak-free. Raised Bed Brackets – I used Frame It All’s heavy duty hinged brackets which screw to both inside and outside of the boards, helping support the outward pressure of water. Pond Liner – You’ll need a pond liner that matches the dimensions of the raised bed you build + extra for the sides and additional overhang just in case. First, create an above-ground frame for the pond by constructing a basic raised garden bed using pressure treated lumber and raised-bed corner brackets. Don’t use a flimsy set of raised bed brackets- they will need to be strong to support the outward pressure of water. My pond was built on a slight hill, so 3 sides have stacked 2×6’s while the highest side has only one board. Leveling your raised bed isn’t technically necessary, but if you want a waterline that is parallel to the top edge of your boards, you’ll need to pay attention to high and low edges. You may choose to dig an inch or two to set the boards on one side lower, or just use bricks or shims to lift the boards of the lower side. 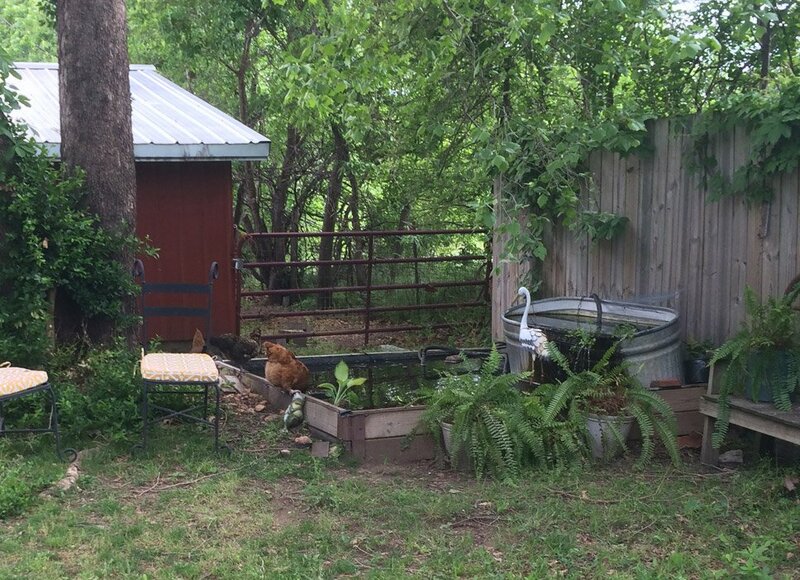 Hawk Hill’s above ground pond, populated with ferns and hostas in the summer, is a popular hangout for the chickens, who prefer it to their waterer when free ranging. 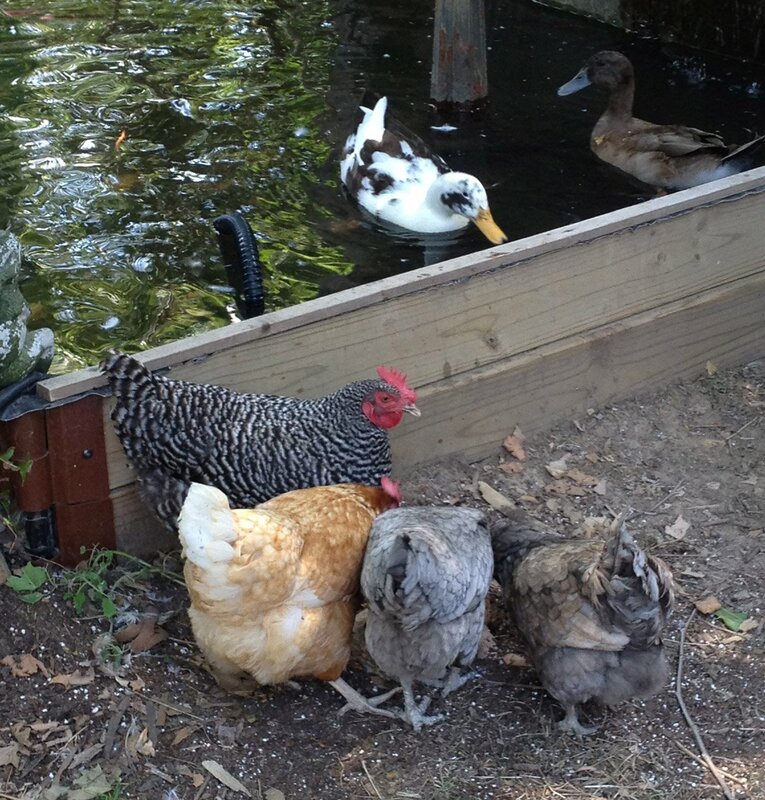 Next, you’ll need to find something to use as a pond liner. Commercial pond liners are easy to find and nice because they are low maintenance, but for this project, I managed to find a used advertising billboard tarp for my pond liner, helping keep my project cost very low. Spread your liner over your raised bed, with at least 3ft of material overlapping over each side, and use a hose to fill the pond about 1/3rd of the way- just enough water to weight your liner down into the corners of the frame. STAY CLOSE while the water fills and help manipulate the liner to help it sink evenly and neatly to the bottom. As it fills, you’ll need to create folds to make the liner accommodate the sharp corners of this pond design. This is easiest done with only as much water in the pond as absolutely necessary to weight the liner. If you want to be able to drain your pond (as opposed to pumping-out for cleaning) pause here and hit up your local hardware store for plumbing fittings that can be screwed to either side of the tarp/liner to create a drain connected to a hose with a shutoff valve. Continue filling. The rising water level will inform you how well you leveled your sides. At this point, you can use shims to make slight corrections by lifting corners or adding space between sideboards. Final steps neaten the overlapping liner and provide a finish. I recommend completing this step with the pond filled completely. Although you’ll probably get a bit wet, the result of finishing the edges with the liner fully weighted (as it will be when it is in use) is the best way to ensure the longevity of your liner and sides. With the pond filled completely, go around the perimeter of your pond, cutting the liner like a pie crust (letting it drape over the edges by about 6″ on all sides). This step just neatens things up enough to make the next steps easier. Continue around the sides of your pond, taking care at corners to fold and tuck excess tarp material. Once the furring strip board is added on each side, use a sharp knife to carefully cut off any tarp showing on the outside of your pond. Once the sides are finished using these final steps, you have a ready to use garden pond for only the cost of lumber, brackets, and a tarp! 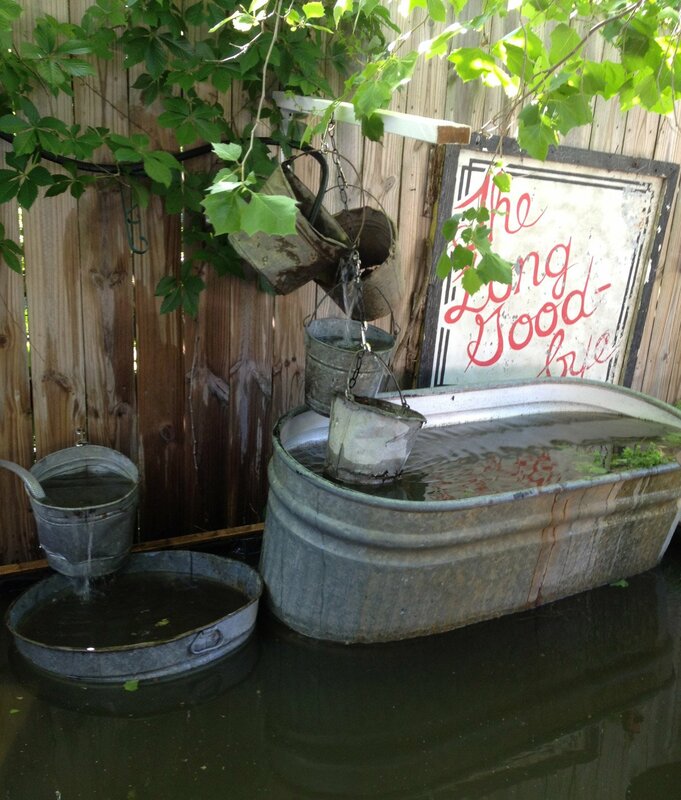 You can create an endless assortment of water features by adding pumps, troughs, and raised vessels to your pond. 2012 pond fountain arrangement. The 100 gallon galvanized trough is set on bricks and creates a large overflow waterfall. The smaller bucket fountain on the right is sourced by a smaller pump forcing water through a UV filter- preventing algae accumulation. Maintaining an above ground pond in the winter can be a challenge. You may choose to drain your pond- although if your pond supports fish you may want to try and keep your pond partially thawed all winter to help your pond fish survive and grow larger. 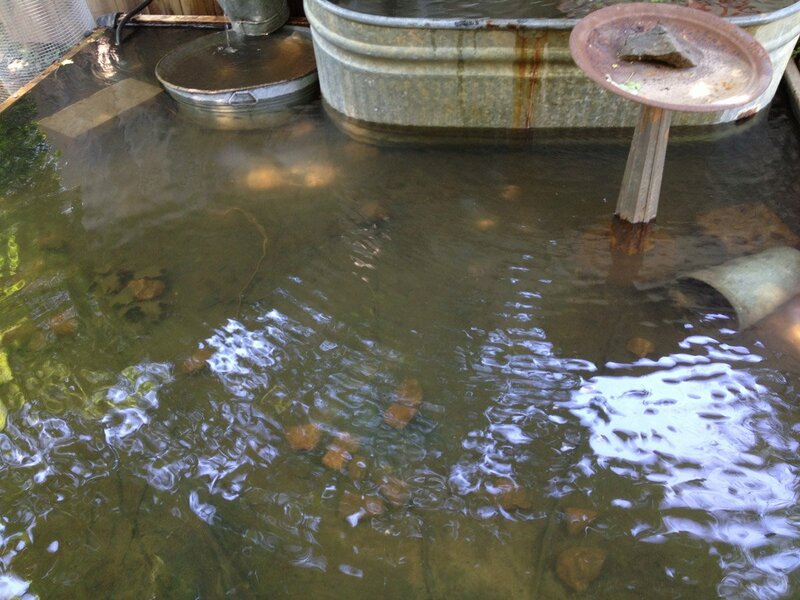 An above ground pond will freeze more quickly than in-ground garden ponds, however in zone 6 I have successfully overwintered ordinary goldfish even in exceptionally cold winters with sustained temperatures below 10 degrees F by keeping water circulating with a pump and by providing insulation in the form of a filled 100 gallon trough sitting on cinder blocks in the water. The combination of insulation and moving water has produced hardy fish that thrive. You may wish to purchase a commercial pond-deicer which will maintain your pond at just-below freezing. See also our article on using compost during the pond-building process to create a self-heating pond. 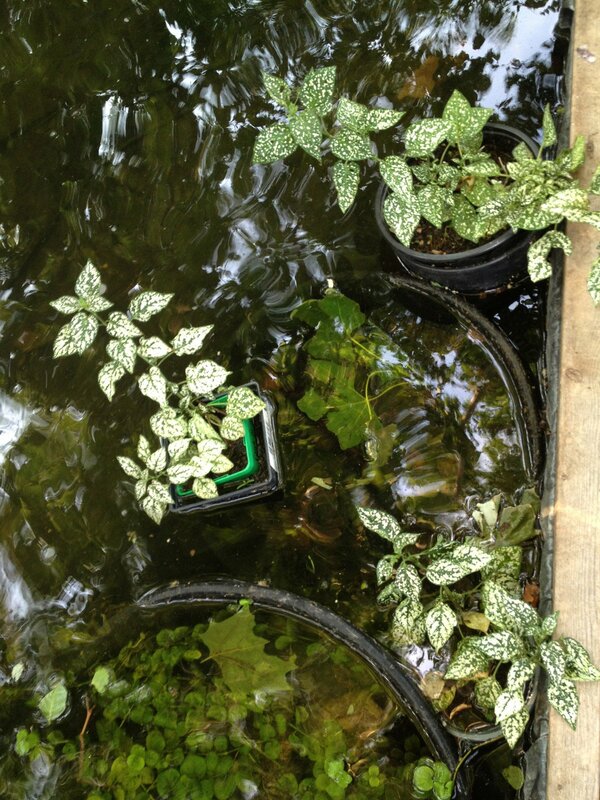 Hypoestes (aka Polka Dot Plant – a common houseplant) enjoys its roots sitting in a pond in the warm months. Also in this photo: the underwater growth is Creeping Jenny- a cheap and easy to propagate perennial that prefers to be above the water level but tolerates submersion. Watercress- which you can find at most grocery stores, loves a cool temperature pond and the massive root system does a great job filtering water. Watercress prefers moving water- I keep my watercress stable at the top of a waterfall using a piece of hardware cloth. See the end of this article for more information on growing watercress. A UV filter keeps the pond crystal clear through the summer months but has to be unplugged and drained completely for winter. Take my advice and don’t get ducks. Adorable and filthy, they made my pond disgusting! 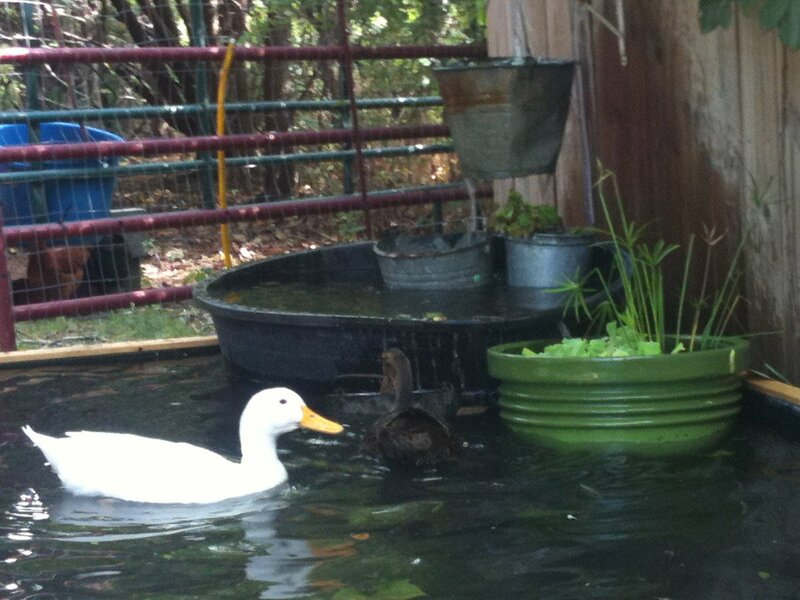 All my pets prefer the pond to their troughs or bowls. 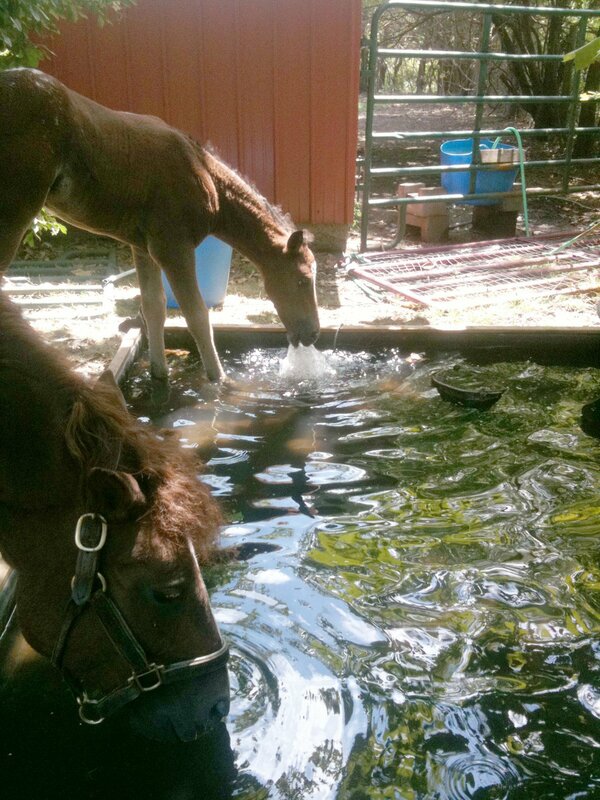 In this photo, a 2-month-old foal is ankle deep in the pond investigating the pump. To grow watercress in your garden’s water feature, you can buy starts at the grocery store or farmers market. (You do want to be careful to be sure and purchase true watercress, though, not “upland watercress” which has a very different growing pattern and won’t thrive in a water feature) Once you have shoots of watercress, you can easily root the shoots in your water feature by securing the shoots to a stable area so they won’t be caught in your fountain or filter. Even if the watercress doesn’t have significant roots still attached, placing the sprigs in a nutrient rich environment of moving water will ensure that rooting occurs quickly. Watercress works as a natural filter as its thick root system filters water approaching the waterfall and provides a home to diverse and healthy pond life. I use metal hardware cloth (aka cage wire) to hold my watercress in place near my pond’s waterfall without allowing the watercress to flow over the waterfall. I take the new watercress each spring and place each sprig securely through an opening in the wire mesh (without getting too preoccupied with making sure the watercress is “woven” in). Simply holding it in place for a few days will be sufficient to secure the sprigs in place until the roots begin to grow and intertwine- at which point you’ll find it difficult to remove the watercress from the hardware cloth! When growing watercress in the early spring, it is prolific and grows in large masses far earlier in the growing season than other vegetable garden plants begin producing. 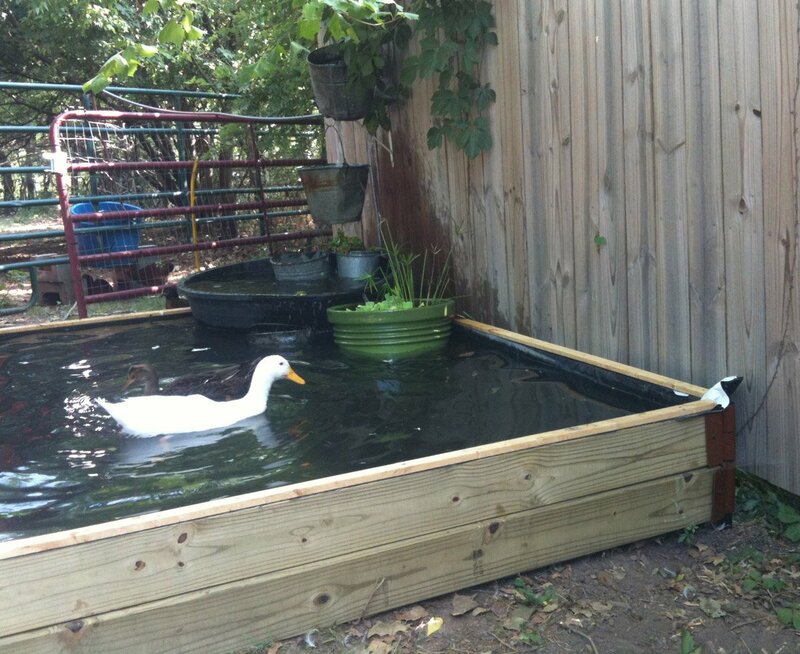 Using this method, you can help your backyard garden pond contribute to growing edibles in your garden. 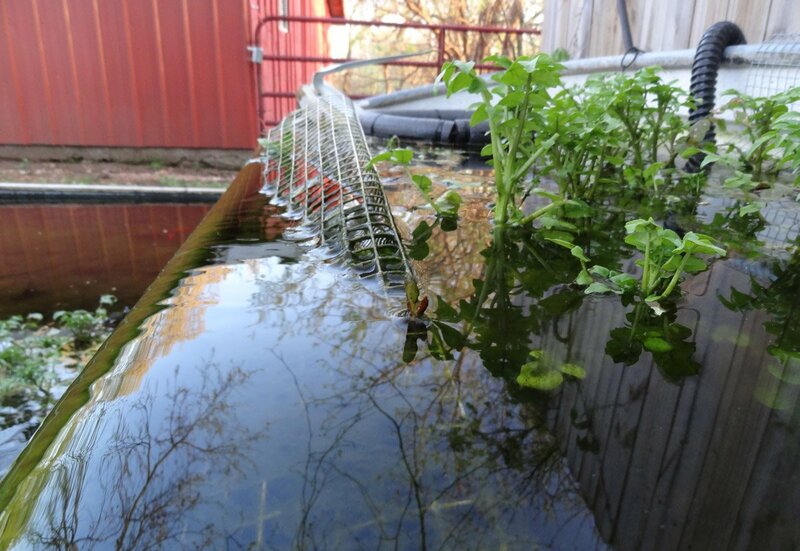 Watercress can be harvested continuously for salads, sandwiches, and snacks from early spring into summer, providing effective, natural, and chemical free filtering for your backyard pond in the process. 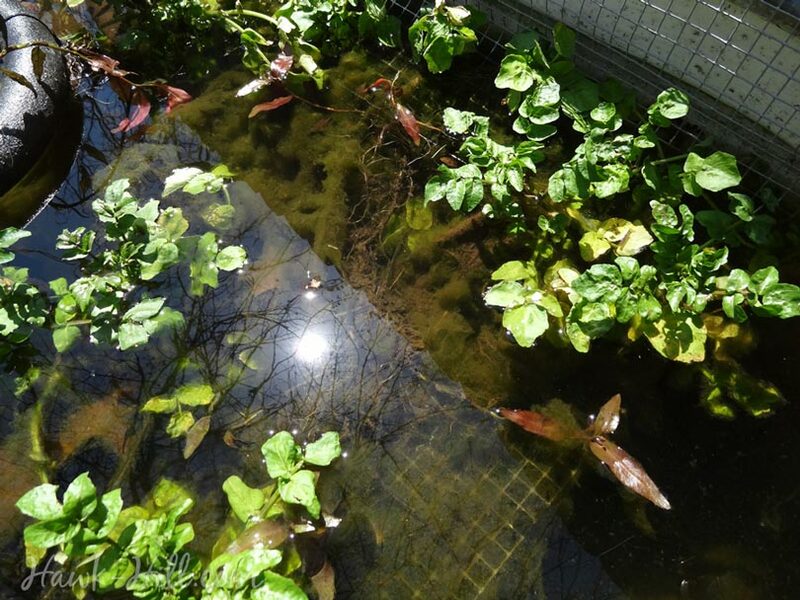 Watercress rapidly producing in a fountain and a floating planter in a garden pond in late winter. I love, love, love your website!! I began by looking at your horse head Christmas wreath and just could not stop checking out your great ideas. This above ground pond is just what I have been looking for. Thanks so much for sharing your creations with the rest of us. Awesome! Thanks for letting me know you liked it! I would love to see how your pond turns out! How did you keep it clean with ducks? It was really hard! But easier because I had well water (free) and so just added a flange and spout with screw-on cover to the tarp at the point where the ground was the lowest, so when the water got gross I could drain and refill. I like this! I’m buying a home with 2 raised bed planters in ATL and would like to do this to one of them for my lab pup to play in who loves water! Any suggestions for making this pup friendly? any plants or items that I should not use? ooh! i want this pond but with a fountain in it! can it be done??? i meant just a large pump spouting water, not a separate decorative fountain. how would you plug it in? Totally! You can install a fountain in an above ground pond in exactly the same way you would for a dug in pond. Just drop it in the center so the spout faces up and connect the pump’s cord to an outdoor extension cord (buried or hidden with rocks, etc) using a waterproof cord box. What at ehe dimensions of your finished pond? This pond was 10ft x 10ft x 8-12″. This design is scalable, but beyond 10 ft you’ll need to add support for the sides to keep the pressure of the larger amount of water from bowing the sides outward.